Our Valencia blackout roman shades come standard with a classic flat panel design. 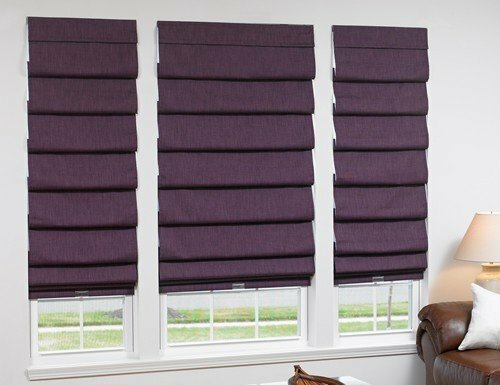 These simple but elegant roman shades are made from blackout fabric panels sewn together to give an extra touch of style. Each side is also hemmed to protect the edges from fraying as well as added style and design. Our blackout roman shades are made from lightweight 100% polyester fabric designed to block light with a neutral colored thermal backing. Each fabric Roman Shade comes with flat fold and a standard fabric valance and color coordinated cords or upgrade to a cordless lift. Simple installation with snap in bracket. W: 18" 19" 20" 21" 22" 23" 24" 25" 26" 27" 28" 29" 30" 31" 32" 33" 34" 35" 36" 37" 38" 39" 40" 41" 42" 43" 44" 45" 46" 47" 48" 49" 50" 51" 52" 53" 54" 55" 56" 57" 58" 59" 60" 61" 62" 63" 64" 65" 66" 67" 68" 69" 70" 71" 72" 0/0"1/8"1/4"3/8"1/2"5/8"3/4"7/8" H: 36" 37" 38" 39" 40" 41" 42" 43" 44" 45" 46" 47" 48" 49" 50" 51" 52" 53" 54" 55" 56" 57" 58" 59" 60" 61" 62" 63" 64" 65" 66" 67" 68" 69" 70" 71" 72" 0/0"1/8"1/4"3/8"1/2"5/8"3/4"7/8"
We ordered this Roman shade for our kitchen in Beige. We ordered this Roman shade for our kitchen in Beige. Please note if you want the shade to appear as the picture you must choose the Hobbled upgrade. If not it will be a flat Roman shade which was not the look we were going for. Make sure you ask or chat with a representative to ask any questions as there are no returns or exchanges. We ended up contacting a designer who helped us with an OOPS order. The shade itself is a good material and is a true Blackout. Would purchase again and recommend. They were everything I was hoping for. They were everything I was hoping for. I love them. Looking to buy more! Thank you! These were perfect. Thank you so much for such a good product.